XML is the de-facto format for document structure and information exchange. It is designed for representing structured information in a self-descriptive manner i.e. describes the structure and meaning of your data. Thus you can process this data in other systems, regardless of the hardware platform or operating system. Almost all enterprise databases and applications allow you to export data in XML format. Microsoft Word is the most popular document format. Often you find a need to populate XML to Word document templates for generating contracts, proposals, invoices, compliance documents etc. Automating docx files creation by auto-filling XML data into templates improves productivity and eliminates manual errors. Thus it saves a lot of time and money for businesses. All these approaches are not business user-friendly and are maintenance heavy. For example, whenever there is a change in template, associated code changes require resource-constrained IT team intervention. 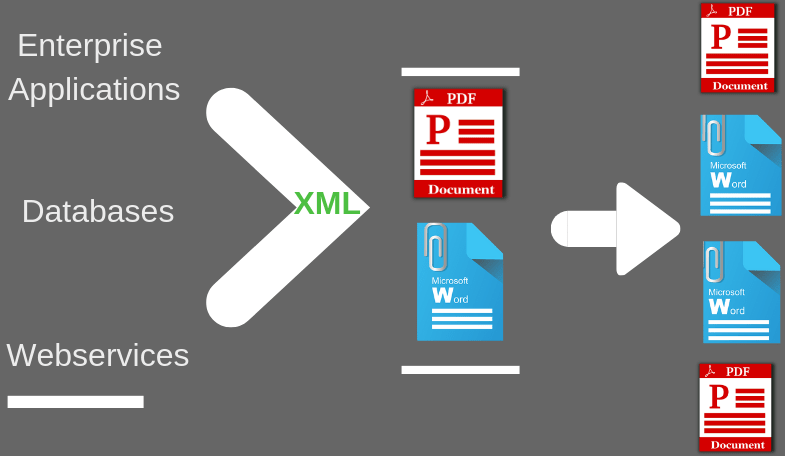 If you are looking for a DIY system to generate documents from XML data then EDocGen is the best solution. It empowers business users to generate docx files themselves using existing templates. They can create/Edit templates in Microsoft Word editor. With an intuitive interface, non-IT users can map the dynamic fields of the document template to XML data. Thus they can control the data they wish to show in the generated documents without the costly data transformations. It supports the dynamic population of text, tables, content blocks, hyperlinks and images from XML data. It also supports multi-lingual templates, conditional statements (if-else), calculations. Ease of Template creation: Business users can use existing document templates. It doesn't force users to switch to the system's templates/formats. Business users can convert existing documents into templates by adding dynamic tags in their favorite Word/PDF editors. Then they populate these templates with XML data to generate documents. Use data as-is: You can populate the XML data as-is without any data transformation. In the mapper screen (field map), map XML data to dynamic fields. On this page, all dynamic fields in your document template get listed along with drop downs of XML data elements. All you need to do is select the appropriate XML element for each dynamic template field. EDocGen supports both on-demand and bulk document generation. Following sections describe how to convert XML to Microsoft Word using EDocGen. 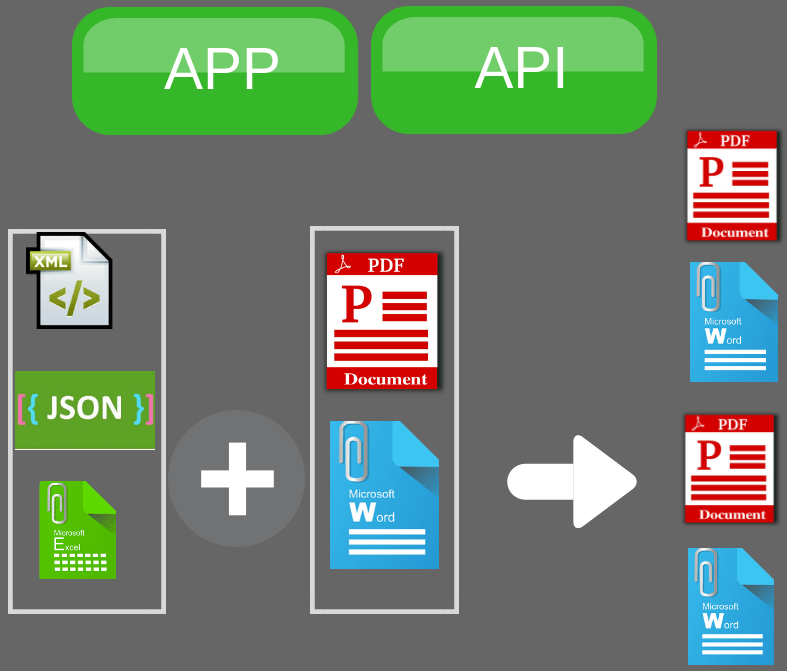 There are two ways to populate XML file to Word using EDocGen - Through App and API. As mentioned, EDocGen supports dynamic population text, tables, hyperlinks, images, text areas, and content blocks into the template. So the first step is to add relevant tags to dynamic fields. EDocGen uses these tags to identify the dynamic sections of the template. After this, upload the template into EDocGen. After upload, you can see your template in EDocGen. Hover over document template and click “Create Document” action button. This opens a screen and in the drop-down select “generate documents from XML". Upload XML and map XML elements to template's dynamic fields. Clicking on the generate button creates bulk documents in zip format in the output folder and would be mailed to your registered email id. As you can see, you can use your existing XML without any data transformation. Mapping screen allows you to populate any valid XML file into the template. If you use the same XML file format, again and again, mapping it every time is time-consuming. More so, if you have a large number of dynamic fields in your template. If XML tag names match with the template's dynamic fields, EDocGen automatically maps them. This allows you to skip the mapping screen and proceed to docx documents generation. Please refer to working example for a detailed account of how to go about XML to word document population. API integration allows you to generate documents right from your existing IT infrastructure. Thus you can create proposals, contracts, invoices etc. either on-demand or bulk from core systems. This step is the building block of the digital transformation, saving you thousands of hours and improving your customer experience. Though there are few other APIs in the market, what separates EDocGen is its flexibility, openness and cross-platform compatibility. It empowers business users by allowing them to create/edit templates in their favorite Microsoft and PDF templates. EDocGen is API first product and offers advanced features such as the population of nested tables for up to 4-level XML files. The populated data automatically adjust font-size to protect document formatting. Whether you are creating a single document or multiple documents, EDocGen is the best solution for converting XML file to Word. You can find a few examples of XML to Word population here. Register and start populating your XML data into Word template. Give it a try by registering.